It has been a gradual development but it appears that Wrightsville Beach, NC has earned a solid reputation among SUP enthusiasts from all over! One of the sport's most coveted events will be held for the fourth consecutive year. The Carolina Cup is set for April 23rd through the 27th. This series of races entices an impressive roster of SUP professionals. 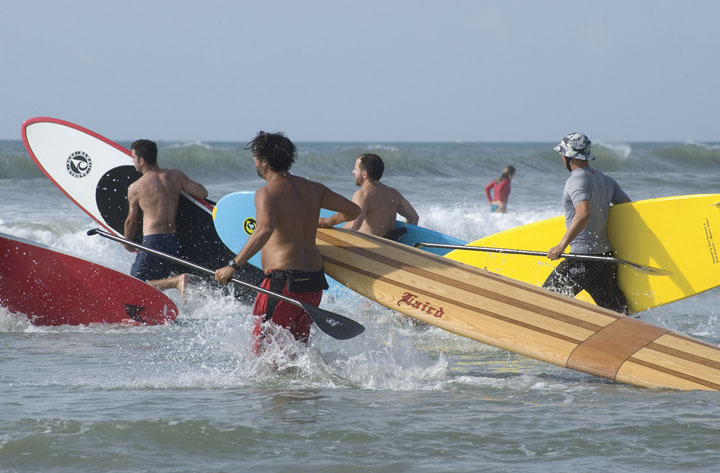 Over 700 participants are expected to compete in one of several divisions, including, SUPs, outrigger canoes, ocean kayaks, surf skis and traditional, prone paddleboards. The local course has made a name for itself due to the fact that it's known as one of the most technically elite in the sport. In fact, National Geographic's Outside Magazine, cited the Carolina Cup as one of only two "must-attend" SUP events on its monthly race guide. The World Paddle Association also sanctions this race series. Spectators this year will be treated to the fierce competition and high drama offered by the 12.5 mile "Graveyard Course", which circumnavigates Wrightsville Beach and Harbor Island's interior. Three-time elite division men's winner Danny Ching, and 2013 elite division women's winner Annabel Anderson will defend their titles in this thrilling race. Prior to the action in April, the 5th annual Wrightsville Beach Biathlon took place on Saturday, March 22nd. Reported to be the first of its kind, this race combines running and standup paddling. The 8-mile course draws both relay teams and bi-athletes. We are fortunate to be able to witness these exciting races and amazing athletes first hand. Have a look at the courses, and choose a vantage point for taking in some of the finest SUP action on the east coast! Learn more at The 2014 Carolina Cup.